Ski Childcare in Val d’Isère | YSE | Compare prices and facilites. Please note that all prices quoted are for 2017-18. We will quote the 2018-19 prices as soon as we get them. In our experience, every child’s needs and every parent’s expectations are different. We are loath to get involved with childcare, preferring to leave it to professionals, so we hope that you will speak to whoever may be arranging your childcare, meet the carer and go around the chalet together to satisfy yourself that they can keep your children safe in it. For example, if your child is the adventurous sort who will disappear up the chimney, the carer needs to know that and to be particularly vigilant! The childcare facilities listed here have been used by YSE guests, but as we haven’t used them ourselves, we cannot give our own personal recommendation. Prices are for Winter 2018-19 where the childcare company has sent us their new prices, otherwise last year’s prices are shown as a guide. Nannies are British or English-speaking. t4 Nanny charge per nanny rather than per child, in sterling. We can check availability of t4 nannies when you book your holiday. YSE guests receive a 10% discount by quoting the discount code YSE1819 when enquiring. 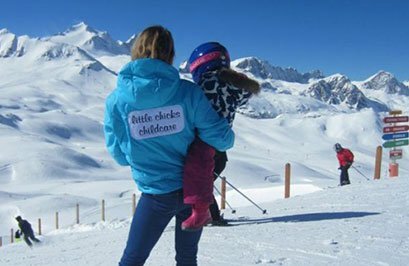 Little Chicks is run by Laura Fitzmaurice who has several years’ experience working in Val d’Isère. Little Chicks British nannies are fully qualified and have extensive experience with all age ranges. All are DBS (formally CRB) checked. You choose the hours the nanny works, and the nanny will come to your accommodation with pushchairs, bouncers, play gyms, toys, sledges, swimming goggles, etc, and will arrange activities in and around the resort. Peak weeks are 16, 23 & 30 December 2107, 6 January, 10, 17, 24 February, 24, 31 March and 7 April 2018. The Jelly and Ice-Cream office is in the Galerie des Cimes. You pay per nanny, not per child, and one nanny can look after up to three children if all are aged over two, or two children of any age. 75% of their staff are NNEB qualified or equivalent, and the remainder have experience of working with children as teachers, nurses, nannies, au pairs, etc., and have at least two years’ experience. Nannies are British or English-speaking. Jelly Lunch Club offers lunch and supervision from noon until 2pm, for children finishing ski school at 12 or 12.30. They also hire out baby equipment. A week’s hire of a single pushchair is around €45. Val d’Isère’s skiing crêche and kindergarten is right on the nursery slopes by the Rond Point, where the buses turn. The lower age limit has been reduced from 3 years to 18 months, while older children can enjoy the brilliant facilities including a lovely play area in the snow. It is now run by one of our directors’ former nanny, Gladys, who makes sure that YSE children are particularly happy, as she has for the last five years. They will also take children to and from ski lessons and look after them for the rest of the day. Open from 9am to 5.30pm every day except Saturday. Half day at the kindergarten with lunch and accompaniment to and from ski lessons, €62. Close to our chalet Charlotte, just beyond the church, Le Petit Poucet looks after children from 3 years. Open 9am to 5.30pm every day, options available are full days, half days or lunchtime only. They will also take children to and from ski school lessons. Comprehensive and clear website. Petit Poucet has to be pre-booked, with a certificate from your GP to say that the child is in good health. The tourist office has a list of baby-sitters, though they are not vetted. My Travelling Nanny matches you up with a temporary British or English-speaking nanny who travels with you on your holiday. On top of the childcare prices below is the cost of the nanny’s holiday, charged as a member of your party by YSE. The nanny must have a day off, or two half days sometimes, during the week. Finally, our chalet girls are always impecunious and sensible and can often be persuaded to help, but they have their own work and are rarely experienced with small children. Any such arrangement is entirely the parents’ responsibility.